This story is incredible. It’s one of my favorites in all of the Bible. Jesus “one ups” some fishermen by completely astonishing them with his fishing skills. They clearly see who they are when compared to him. Their lives are changed. And they leave everything to follow him. Until last week I’d overlooked the significance of one crucial detail in this story: the fishermen had a boat. Now maybe you’d say “duh,” but think about it. This boat was everything to them. But after meeting Jesus, they were willing to leave their boat behind. They saw Jesus clearly. And they realized he was of more value than their boat. We all have a boat of some sort. There is something that you and I find our identity and security in other than Jesus. There is something that we treasure more than him. There is something that we fear losing more than anything else. 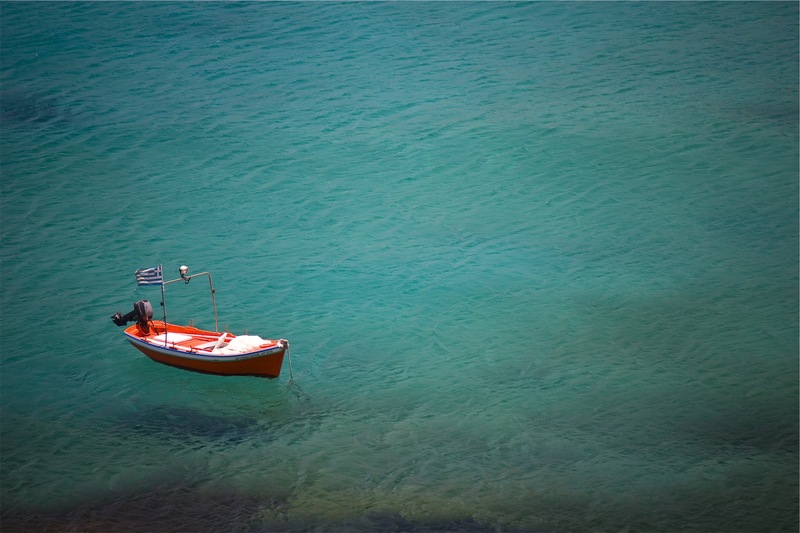 And what Jesus desperately wants for us to do is invite him into our boat. Just like the fishermen did. And let him take over. When we do, we will find a sustained fulfillment that cannot be found elsewhere. We will see ourselves rightly in comparison to him. We will discover someone who is way better than that something else we’ve been holding on to. Last week I taught this to our students at Bell Shoals. You can listen to the whole message below, or fast forward to around 25 minutes as I zero in on what our “boats” might be. You’ve Already Failed Your Resolution…So What?! So it’s been 14 days. 14 days since you or somebody you know made a New Year’s resolution. Research shows that it’s likely not going very well. One particular study suggests that only 71% of people have kept their resolutions to this point. That means 29% of resolution-makers have already messed up in just 2 short weeks. What’s worse is that the same study found that out of the 71% that make it two weeks, only 8% of those people end up achieving their resolutions. So basically, there is a 92% likelihood that you are going to fail your New Year’s resolution if you haven’t already. Forget about that New Year’s resolution. That was so 2 weeks ago. Instead, think of today as your January 14th Resolution. Today, you can commit to the change you intended for January 1st. Today, failure doesn’t have to have the final say in your year. Resetting your life for the New Year is nice. It even makes sense. It feels right. But for some reason, we have bought into the idea that once we fail at our resolution it’s over for that year. We become paralyzed in the state we started in and stop pursuing the change we desired. Maybe your resolution was to exercise 5 days per week. It’s been two weeks, and you haven’t exercised once. You have 2 options: 1) the “maybe next year I’ll exercise and lose weight…didn’t do it this year…already failed my resolution…oh well” perspective, or 2) the “I’ve messed up so far, but today I can start over” perspective. It’s the difference between perfection and persistence. Perfection focuses on never messing up. When it happens, the resolution is abandoned. Persistence focuses on continuing even though messing up is inevitable. Nobody expects perfection out of you. It’s impossible. Even the 8% that “achieve” their resolutions do so imperfectly. What matters is being persistent in pursuing the resolution you’ve made. And when you do, you will eventually see the results. Maybe not right away. Maybe it will take longer than you’d liked. But it will happen. You may have to start again a few more times down the road after failing along the way. That’s okay. But don’t quit just because it didn’t go well since the New Year. So what resolution do you have for yourself? What change would you like to see in your life right now? Is it exercising? Losing weight? Reading books? Better grades in school? Spending more time with your family? Something related to your finances? I don’t know about you, but I always try and make some sort of resolution regarding my relationship with God. For me that relationship is the foundation for my life and influences everything I’m a part of. Thankfully, God is NOT a God of second chances. He is a God of grace – the God of unlimited chances. No matter how many times I fail, He meets me where I am and lets me start over. He is the same towards you. He unconditionally loves you and desires a relationship with you. This year give it a try. Pursue a relationship with God through Jesus Christ. You won’t regret it. If you want to increase your chances of success at your resolutions, there are some practical things you can do. -Ask someone to hold you accountable to them. -Have a plan of action steps. -Make sure they are S.M.A.R.T – Specific, Measurable, Attainable, Relevant, Time-bound. But if it’s a resolution that takes any amount of effort (and the most meaningful ones do) you won’t be perfect. You will mess up somehow. And when you do, you can quit, or start over. It’s okay if you’ve already failed. 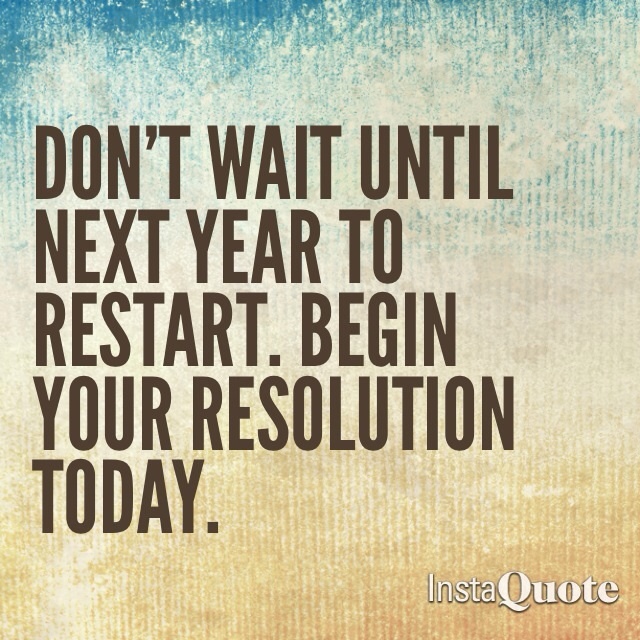 Don’t wait until next year to restart. Make a January 14th resolution! Dan Diamond, “Just 8% of People Achieve Their New Year’s Resolutions. Here’s How They Do It,” Forbes, January 1, 2013. Read here. To most people this date means very little. You may not remember where you were or what was in the news, what the weather was like or who you were with. But I do. I was in Charlotte, NC at Hawthorne Lane UMC with my closest friends and family. It was cold and rainy. The anticipation and excitement had been building for close to a year. I cried my eyes out as she walked down the aisle. It was the day I married my wife, Rachel. That was 4 years ago today. 4 years! I can’t believe it’s been that long. I know it’s an overused saying, but it really does seem like it happened yesterday. I can still play every detail of the ceremony and reception over in my mind. It was beautiful. Emotional. Spiritual. Worshipful. Detailed. Fun. I’ll never forget it. And while our wedding day 4 years ago was fantastic, it pales in comparison to our 4 years of marriage. Why? Because a marriage is better than a wedding. It’s great that we made a public commitment to each other 4 years ago, but what’s better is that we’ve stayed committed for 4 years. It’s great that we said “I do” 4 years ago, but what’s better is that we’ve said 1,460 “I do’s” since. It’s great that we loved each other on our wedding day, but what’s better is that our love has grown each year. That’s why we’re not just celebrating 4 years since our ceremony. An event. We’re celebrating 4 years of being married. A relationship. Our marriage is not perfect. It’s not without disagreement at times. We have many areas to work on as a couple. I have a LOT of areas to work on as a husband. But it’s a marriage. A relationship. Something we are committed to. And that’s cool. That’s worth celebrating! I don’t pretend to be a marriage expert. I’ve only been at this for 4 years. But as I was thinking about this post, I realized there are lots of things that I’ve learned from 4 years of marriage. And some of those greatest lessons have been discovering what strengthens our marriage. Since I couldn’t write about all of those, I narrowed it to 4 things. They are commitments we will continue to strive for as we press on to our 5 year anniversary and beyond. If you are married, thinking about marriage, or think you might one day think about it, take a look at these. I pray they help to make your marriage better than your wedding day. Every relationship will have tension at some point or another. How you enter it could make all the difference in the outcome. I don’t know about you, but I am great at making up stories in my head about the intentions of other people. And those intentions are not normally good ones that I imagine. But that’s my bad. That’s assuming the worst. When you have an attitude of assuming the best, tension is easier to work through. Because you go in believing that the other person is on your side. They love you. They want what’s best for you. And they don’t want to hurt you. It makes a world of difference. 2. Talk About the Deep Things. I’m not necessarily talking about having intellectually deep conversations. Though those are good to have as a couple if you’re into those. I’m talking more about the deep things you wrestle with. The disagreements. The frustrations. The things in your heart. The questions you have. The doubts. The feelings. The ups and the downs. The emotions. Your dreams. Your goals. Your passions. Don’t stuff them. Talk about them. And say “I’m sorry.” Talking leads to growth. This might sound cliché to some and counterintuitive to others. I get that. But this is the single most important factor to our marriage growing. Two people striving to love Jesus learn more and more about the love, forgiveness and sacrifice he modeled and called his followers to emulate. 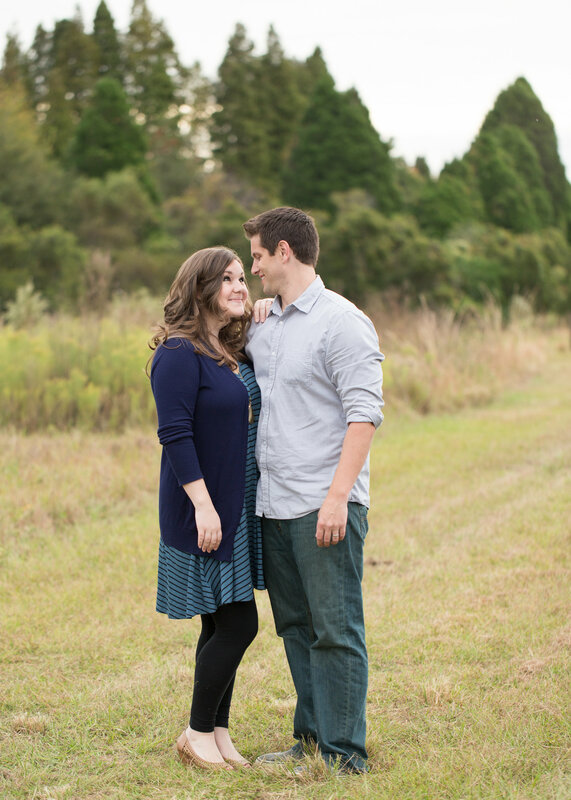 Husbands are challenged to love their wives like Christ loved the church…that’s quite a challenge. And most importantly, couples are called to love Jesus more than each other. As they do that, they actually love each other more than if they were trying to love each other without Jesus. Out of their overflow for Jesus they love one another. It’s a lifelong journey. And it grows the relationship. It’s the foundation. I believe a lot of people who are married love one another, but I’m not sure if they like one another. Once the romance of the honeymoon wears off and the kids are born, marriage becomes tough to tolerate. But it doesn’t have to be like that. Thankfully I don’t just love Rachel. I like her. I like hanging out with her. I like laughing with her. I like going on dates with her, and learning more about her. I like surprising her and not taking ourselves too seriously together. We’re friends. The BFF kind. Become best friends. It’s worth it. I love Rachel. So much. She’s the most beautiful person I’ve ever known. She loves me more than I deserve. She is a mom who cherishes our little girl. She’s a worshipper who loves Jesus most. She’s my best friend. I’m beyond blessed to call her my wife. I wouldn’t want to spend my life with anyone else. Here’s to another year. Happy 4 Year Anniversary, Rachel!